H₂O might be the most familiar chemical compound on the planet. Many people know that water is H₂O, but most wouldn’t think about what that means in a chemical sense. Water is a remarkable molecule made of two Hydrogen atoms bound to a single Oxygen atom: H, H, and O. Water’s special properties give us life as we know it, and we’re mostly made of it too. It’s less dense as a solid (ice) than as a liquid, which has major consequences for the planet and its climate. Water is also really good at storing heat, and it stays liquid over a wide range of temperatures, also very handy for life as we know it. In short: water is amazing: but can we destroy it? Yes. With just two regular pencils and a 9V battery, you can actually break water down into it’s Hydrogen and Oxygen components, and watch them boil away as bubbles of gas. This is fundamental chemistry available to anyone at home, with stuff you might have lying around. 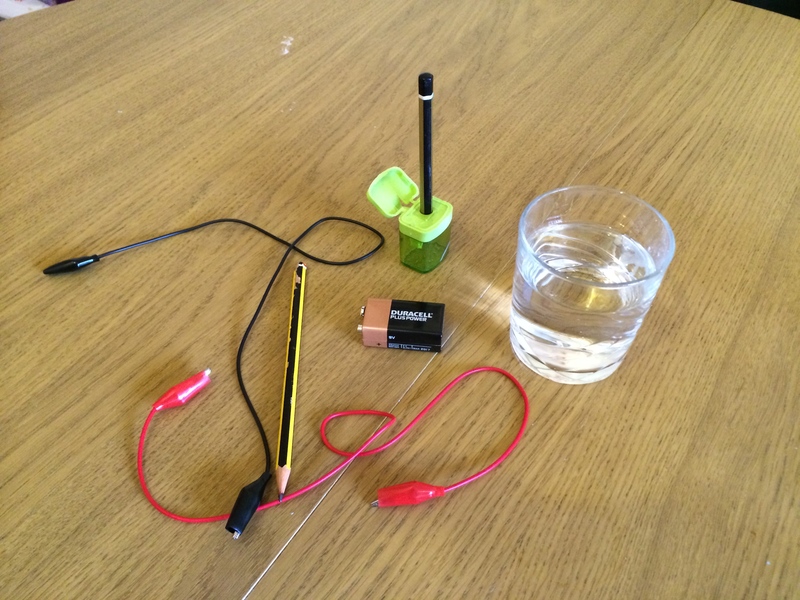 You’ll need some salt, a 9V battery, a drinking glass (or other transparent container), two pencils, and some wire. It ’s best to get some cheap cables with crocodile clips (I bought these ones from Amazon), since they make it much easier. Pour some warm water in the glass and stir in a tablespoon of the salt. You should probably also open a window – or at least don’t do this in a tiny cupboard – a small amount of Chlorine may be produced as you do this experiment; it’s not dangerous as far as I can tell, but best to be safe. Sharpen both the pencils at both their ends – so that’s four pencil points in all. 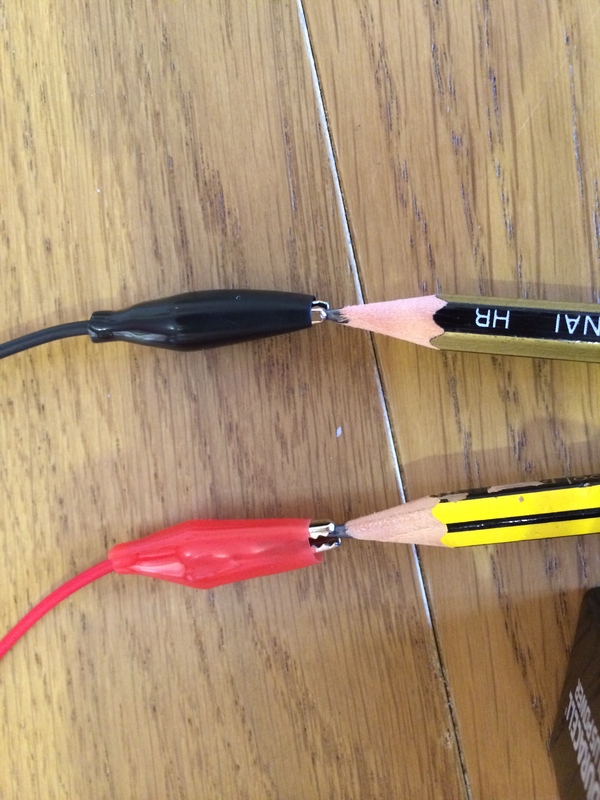 Connect both nodes of the battery to a different pencil using the crocodile clips. Put the free pencils ends into the water, and don’t let the tips touch. Now for the science! At this point the water becomes part of the circuit. 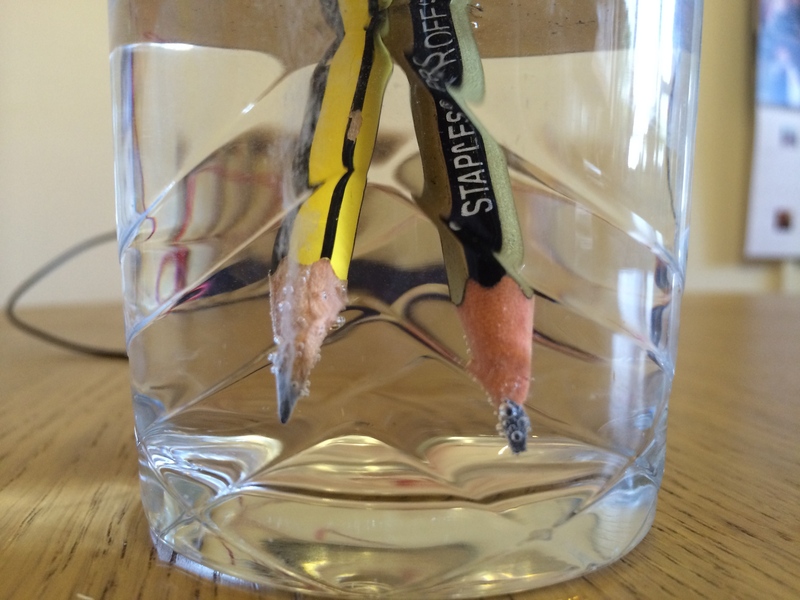 Electrons flow down one pencil, across the water and back into the other pencil. This creates a circuit and electrons flow around it. You’ll know it’s working because this process quickly creates bubbles at the pencil tips in the water. It happens almost instantly. The energy of the electrons in the circuit is enough to break the water into Hydrogen and Oxygen ions: electrically charged versions of the elements themselves. These ions then flow to the oppositely-charged pencil tip, creating an electric current. This is known as electrolysis. At the negative pencil tip (the anode) positively charged hydrogen ions (or just protons to some people) meet and form hydrogen gas (H₂) that bubbles to the surface. The positive pencil tip (the cathode) draws the negative Oxygen ions and form O₂. It’s a bit more complex than that, if you’ve been counting electrons, but that’s the overall result. This is electrolysis of water and it’s the world’s primary way of producing Hydrogen – for example for hydrogen fuel cells. You might be wondering why we need salt. This could be done without salt, but it wold happen more slowly. Can should try it, to prove it to yourself. Salt dissolves into the water creating ions of its own. These flow around the circuit too (creating Sodium and a tiny volume of Chlorine gas) and helps increase the circuit’s overall flow of electrons. You might be able to smell the faint whiff of Chlorine if you do this for long enough. 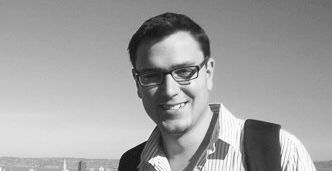 If you want to take this further, you might think about how to collect the Hydrogen and Oxygen separately – and what you might do with them if you were doing this on an industry scale. What would happen if you touched the tips together?